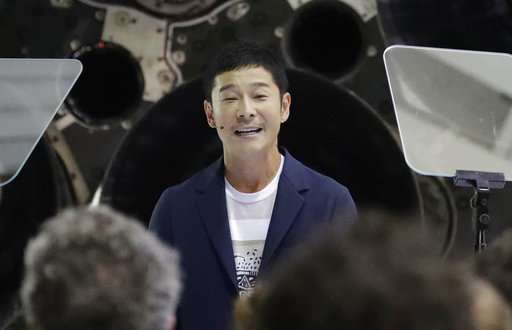 After announcing that he'll take the first-ever commercial rocket trip around the moon, Yusaku Maezawa said he wants company for the weeklong journey. The Japanese billionaire said he plans to invite six to eight artists, architects, designers and other creative people to join him on board the SpaceX rocket "to inspire the dreamer in all of us." Maezawa, 42, said he wants his guests for the lunar orbit "to see the moon up close, and the Earth in full view, and create work to reflect their experience." Musk said the entrepreneur, founder of Japan's largest retail website and one of the country's richest people, will pay "a lot of money" for the trip but declined to disclose the exact amount. 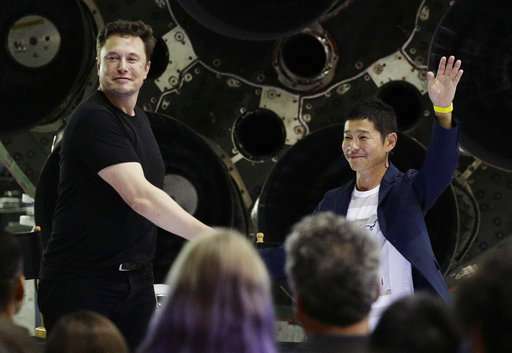 Maezawa came to SpaceX with the idea for the group flight, Musk said. "I did not want to have such a fantastic experience by myself," said Maezawa, wearing a blue sports jacket over a white T-shirt printed with a work by the late painter Jean-Michel Basquiat. He said he often mused about what artists like Basquiat or Andy Warhol might have come up with if they'd traveled into space. "I wish to create amazing works of art for humankind," Maezawa said. Maezawa didn't immediately say who will be on his guest list for the spaceflight, but in response to a question from a reporter he said he'd consider inviting Musk. "Maybe we'll both be on it," Musk said with a smile. The average distance from Earth to the moon is about 237,685 miles (382,500 kilometers). Astronauts last visited the moon during NASA's Apollo program. Twenty-four men flew to the moon from 1968 through 1972, and half of them made it to the lunar surface. Maezawa, a former musician, founded the retail firm Start Today in 1998 and built it into one of Japan's most successful companies. In 2012, he started the Tokyo-based Contemporary Art Foundation to support young artists. He made headlines in 2016 when he paid more than $57 million at auction for an untitled work by Basquiat. A year later, he paid more than $110 million auction for another piece by the same artist. That original mission would have used a Falcon Heavy rocket—the most powerful rocket flying today—and a Dragon crew capsule similar to the one NASA astronauts will use to fly to the International Space Station as early as next year. 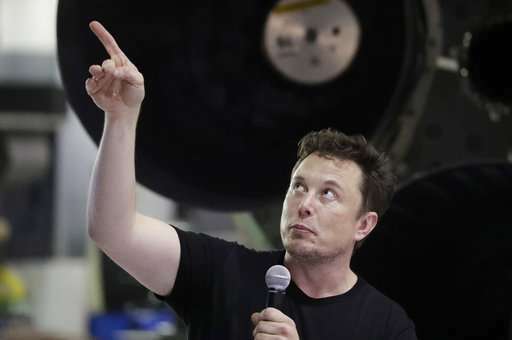 Musk's successes have recently been overshadowed by his behavior and the struggles of his Tesla electric car company to deliver. Attaching billionaires to giant rockets. I'm all for it.